Chicago Shakespeare Artistic Director Barbara Gaines, Executive Director Criss Henderson and Board Chair Sheli Z. Rosenberg were joined by Navy Pier, Inc. CEO Marilynn Gardner and Board Chair William J. Brodsky as well as Chicago Mayor Rahm Emanuel on Friday to announce the creation of an innovative performance venue, The Yard at Chicago Shakespeare. Construction on the theater begins this spring; Chicago Shakespeare plans to stage its first production in The Yard in the 2017-18 Season. Introducing a global trend in theater architecture to Chicago, the vision for the new theater focuses on resourceful, sustainable and adaptive design. 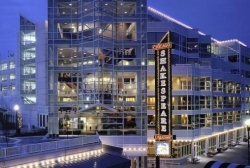 At a cost of $35 million, the project repurposes components of the venue formerly known as Skyline Stage, located adjacent to Chicago Shakespeare. The Yard is connected to the existing facility, which currently houses two theaters, through expanded lobbies. The year-round, flexible venue can be configured in a variety of shapes and sizes with audience capacities ranging from 150 to 850, defining the audience-artist relationship to best serve each production. 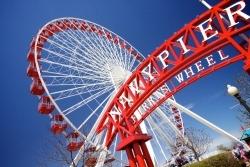 Navy Pier’s Centennial Celebration will kick off with the opening of the new Ferris wheel on May 27, followed by the unveiling of the Polk Bros Fountain and Plaza, Louis Vuitton America’s Cup World Series Chicago from June 10 through 12, 4th of July celebration, Tall Ships Chicago from July 27 through 31, and the opening of The Yard at Chicago Shakespeare in Fall 2017.